The Dwarfie Stane is a fascinating 5000-year-old block of red sandstone which has been cut to create a burial chamber. 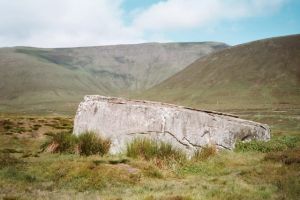 The stane lies in a valley near the northern tip of Hoy, between Rackwick and Quoyness. The stane is possibly the only British example of a rock-cut tomb. The chamber was created sometime between the Neolithic and Bronze Age periods, with the most likely date being sometime around 3000 BCE. The carvers used simple antler or stone tools, a process which must have taken enormous time and patience! A three-foot square opening is cut into the west face of the stone. This opening leads to an inner chamber, containing a pair of hollowed out spaces like very short beds. The ledges are much too short for a person of ordinary size, leading to the local legend that the chamber was cut for dwarves, hence the name 'Dwarfie Stane'. Another theory is that the chamber was a hermit cell. Just outside the opening is a sandstone block used to seal the entrance. Records indicate that the tomb was sealed as late as the 16th century. Nearby accommodation is calculated 'as the crow flies' from Dwarfie Stane. 'Nearest' may involve a long drive up and down glens or, if you are near the coast, may include a ferry ride! Please check the property map to make sure the location is right for you.